For some reason hubby loves Hamburger helper. Must be left over from his bachelor days. Now I can't have pre-prepared foods so I made him a substitute recipe that tastes even better. 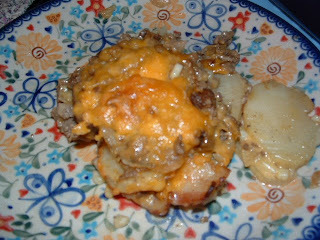 I make in advance too which makes a great weeknight casserole ready to pop in the oven when you get home. Hubby likes the texture of Velveeta, but I find it a bit rubbery. So I tried Land of Lakes American cheese and it slices great while still giving you that smooth creamy cheese texture when it melts. Toss bacon and corn together. 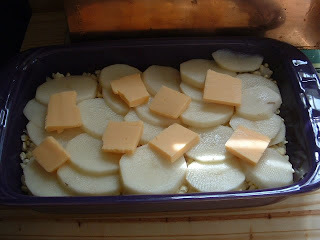 Place a thin layer of cheese slices over potatoes. 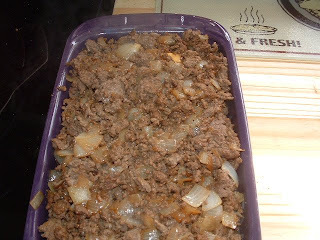 Brown hamburger and onions together. Salt and pepper well while meat is browning. Drain off fat. Layer over the potatoes and top with another layer of potatoes. Salt and pepper again and layer with another layer of cheese. Uncover and bake another 15 minutes. **I like to make these back to back (that way I also have 2 meals ready to go with half the mess) so the left over bits of browned sausage and caramelized onion add flavor to the hamburger. I think I could even handle this recipe �� I also noticed the butterfly's on your plates! Allie would love them! LOL of course you can! When you visit these are the plates we will use! I love my polish pottery for the same reason - all the cute butterflies and hearts, well and it coordinates so well with my fiestaware.